Accepta 8703 is a high performance, industrial antifreeze, based on mono ethylene glycol (MEG) and has the ability to protect engineered systems down to extreme temperatures as low as -50oC. 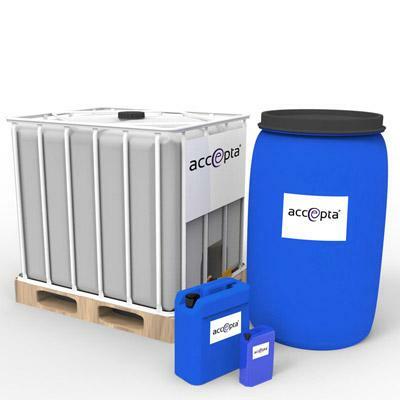 Accepta 8703 has been especially formulated from mono ethylene glycol for use as an industrial grade coolant and heat transfer fluid and is suitable for use in a wide range of industrial. It is however, not recommended for use in food processing or water purification applications. Accepta 8703 has a mild odour and is miscible with water in all proportions and can protect systems down to —50oC depending on concentration. A tracer dye or colourant can be added to Accepta 8703 allowing it to act as a leak detector. The minimum dose of Accepta 8703 is not usually less than 20% of the system volume and the maximum does not normally exceed 60%. We recommend the use of deionised or distilled water for this dilution. Avoid water containing high levels of calcium salts or Chlorides [Cl–].